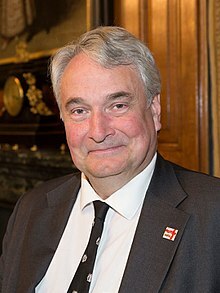 Robin C W Tilbrook (born 1958) is a solicitor and English politician, the chairman and a founder member of the English Democrats, a political party that advocates English independence. Tilbrook was born in Kuala Lumpur, Federation of Malaya, in 1958. He was educated at Wellington College, Berkshire, gained a BA (Hons) in Politics and Economics from the University of Kent at Canterbury, and then studied at The College of Law, Chester. He was a Coldstream Guardsman, and has worked in a factory, in junior management, and as a teacher at primary and secondary level. By 2003 he was a solicitor and a partner in the firm of Tilbrooks in Ongar, Essex. In 2005, he commented after a case, "It is a black day in the courts when they refuse to make a declaration that St George's Day is a special occasion." On 27 September 2011, he became a Freeman of the City of London. He was a member of the Conservative Student Association and a member of the Conservative Party, at one time a Conservative candidate for Ongar Town council. He co-founded the English National Party in 1997, and then helped to relaunch the party as the English Democrats in 2002 to campaign for an English Parliament. He is also the leader and nominating officer. He has stood as a candidate for the English Democrats in local, parliamentary and European elections. Standing in Epping Forest, he received 1.4% of the vote in the 2005 general election, 4.4% at 2005 Essex County Council election, 18.2% in the 2007 Epping Forest District Council election, and 11.3% in the 2009 County Council election. He gained 2.01% of the vote as the lead candidate for the East of England region in the 2009 European election. By 2006 the English Democrats, based in Norwich and chaired by Tilbrook, had adopted the policies of campaigning for a devolved English parliament, opposing membership of the European Union, opposing further immigration, and wishing to make St George's Day a national holiday. Tilbrook said of the English Democrats in 2006 that the party "agitates for anyone living in England" and that Englishness was "akin to American notions of "Americanness" – that you can be from any ethnic background and still wrap yourself in the flag." In the same year, he criticised spending on St. Patrick's Day in London and added that too little was spent on St George's Day.. In 2009, he said, "We're hoping to do what the Scottish National Party managed to do in the 1970s and break through to being able to influence what happens in Parliament about England". He argues that the money given by the UK to the EU is given to other parts of the country at the expense of England, which makes his party Eurosceptic. Tilbrook is the elder son of the late Brigadier Thomas William Tilbrook, Queen's Royal Irish Hussars, by his marriage to Jacqueline Mackillican. In 1988, his parents were living at Little Cornard, Sudbury, Suffolk, when Tilbrook became engaged to Claire Breed, of Pevensey. They married and had three children. He is a member of the Church of England. ^ Boothroyd, David (2001). Politico's guide to the history of British political parties. Politico's. ISBN 1-902301-59-5. - "English Democrats' 'long game'". BBC News. 29 April 2008. Retrieved 6 December 2009. ^ a b c "National Executive Officers". The English Democrats. Archived from the original on 24 May 2009. Retrieved 7 December 2009. ^ "Our team". English Democrats. Retrieved 7 December 2009. ^ a b c Tobin, Edmund (10 June 2009). "ONGAR: English Democrats leader hails election success". East London and West Essex Guardian. Retrieved 6 December 2009. ^ "Landlord loses St George's Day battle". The Guardian. Press Association. 28 November 2005. Retrieved 6 December 2009. ^ Sparrow, Andrew (18 September 2002). "New party seeks English parliament". Daily Telegraph. Retrieved 7 December 2009. ^ "English Democrats Party". Register of political parties. The Electoral Commission. Archived from the original on 14 December 2009. Retrieved 6 December 2009. ^ "Parliamentary and County Council Elections". Epping Forest District Council. 2005. Archived from the original on 29 April 2009. Retrieved 7 December 2009. ^ "District Election Results 3 May 2007". Epping Forest District Council. 4 May 2007. Archived from the original on 3 May 2008. Retrieved 7 December 2009. ^ Tobin, Edmund (5 June 2009). "EPPING FOREST: Live election results". East London and West Essex Guardian. Retrieved 7 December 2009. ^ "European elections 2009: Eastern region". Daily Telegraph. June 2009. Retrieved 6 December 2009. - Wheeler, Brian (20 May 2009). "Democrats 'putting England first'". BBC News. Retrieved 6 December 2009. ^ a b Rice-Oxley, Mark (30 June 2006). "In a 'green and pleasant land,' English nationalism stirs". Christian Science Monitor. Retrieved 6 December 2009. ^ "English Democrats eye 120 seats". BBC News. 25 September 2009. Retrieved 6 December 2009. - "Democrats want to be 'English SNP'". Daily Politics. BBC News. 25 September 2009. Retrieved 7 December 2009. ^ "English 'lose out to rest of UK'". BBC News. 2 June 2009. Retrieved 6 December 2009. ^ "Miss Claire Breed" in Country Life, Volume 182 (1988), p. 145: "Miss Claire Breed, youngest daughter of the late Mr John Breed, and of Mrs Breed, of The Oaks, Pevensey, East Sussex, is to be married to Mr Robin Tilbrook, elder son of Brigadier and Mrs Tom Tilbrook, of Pond Farm, Little Cornard, Sudbury, Suffolk." This page was last edited on 18 April 2019, at 19:57 (UTC).